Reginald Frank Thorndycraft was born during 1896 in Basted, the second of five children of William and his wife, Jessie Mary Thorndycraft (née Green.) The family lived at Basted Lodge, where William was an estate gardener, and Reginald and his four siblings all attended school in Ightham. By 1911, Reginald had followed in his father’s footsteps and was also working as an estate gardener which became an occupation he held until the outbreak of war. On 3 September 1914 ‘Reg’ visited the recruiting office in Maidstone and enlisted in the Army with the Kings Royal Rifle Corps. At the time he was recorded in a medical examination as being 5’ 11” tall, weighing 140lbs with a fresh complexion, brown eyes and brown hair. Having been passed fit for service he was sent to the regimental depot and attached to the 8th and then almost immediately 11th (Service) Battalions for training. The surplus from the 8th had formed the 11th – hence the quick transfer from one to the other. Now part of the 59th Brigade in 20th (Light) Division, the 11th KRRC were posted to Blackdown in Surrey before moving on to Witley in February 1915, and then Larkhall in April. Reginald had been assigned to ‘A’ Coy and became a stretcher-bearer in Lieutenant Gerald Meredith’s platoon. At 4:30 pm on 21 July 1915 he entrained with the rest of his company at Amesbury for Folkestone, where they embarked on board the SS Queen of Folkestone, for Boulogne. Reginald arrived in France shortly after midnight on the 22nd and marched a short distance with his unit to Ostrohove Rest Camp, which was situated on the heights overlooking the town. Within a month Reginald had experienced his first taste of life in the trenches and was present at the Battle of Loos in late September, although his battalion had not taken part in the main advance. In February 1916 the battalion moved into the Ypres salient and settled down into the routine of life rotating in and out of the trenches, and participated in the Battle of Mount Sorrel in early June. During July the Rifles were sent to the Somme where on 22 August they took over a section of trenches opposite the village of Guillemont. It is with the greatest regret that I have to inform you of the death of your son, Rifleman Thorndycraft. He was killed in action on the afternoon of September 4th during the fight, which had been taking place then. Your son had been in my platoon as a stretcher-bearer ever since the battalion was formed, practically for two years, and both in England and out here, more especially out here, I have always known him to be the most gallant soldier I have met. On every possible occasion he had distinguished himself for coolness under fire and devotion to duty, and he met his death still gallantly attending to wounded men under very heavy shellfire. I had myself sent his name for reward some two months ago, but unfortunately it had not time to pass through the various headquarters. His loss is very deeply felt by all his comrades, and by myself, who have always held him in such admiration and I can sympathise most fully with you in your great loss. But I am sure you will be proud to know you had such a gallant son, and that he died in such a worthy manner. After his death, Reginald was mentioned in despatches for his part in the Somme campaign and was subsequently awarded the Military Medal for bravery. 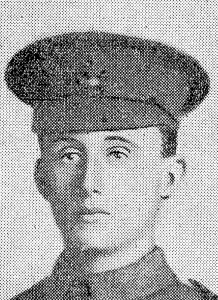 His body was either never recovered, or later identified, and he is commemorated on the Thiepval Memorial.